"This refreshing fruity drink is like tropical punch with a kick. A little umbrella in your glass would be a lot of fun." Fill a tall glass with ice cubes. 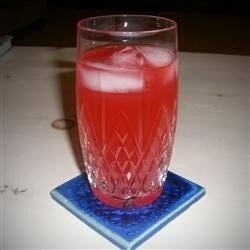 Pour in vodka, coconut rum, grenadine and juice. Stir. So tasty that you can't tell there's alcohol. I doubled the vodka, but that's just a preferance. I could see how these could sneak up. This would be good blended, like a daquiri. This was pretty good but next time I will make it with only orange and pineapple juice. The banana didn't do it for me. The favorite punch of the three I made for my niece's shower. I didn't use coconut flavored vodka, just the plain old variety. Wasn't a drop left. This drink was extremely easy to make and packed a nice little punch. I made the drink for all my friends and every last one of them LOVED this drink!!! !